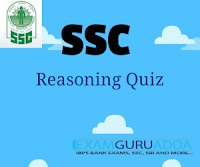 Practice Reasoning quiz for upcoming ssc 10+2 and other exams. 1. QPRS : TUWV : : JIKL : ? 2. FJUL : BOQQ : : LHRX : ? 3. CLOSE : DNRWJ : : OPEN : ? Directions (Q. 6-10): In each of the following questions, choose that set of numbers from the alternative sets, that is similar to the given set.